(PhysOrg.com) -- More than three million years ago, the ancestors of modern humans were still spending a considerable amount of their lives in trees, but something new was happening. David Raichlen, an assistant professor in the University of Arizona School of Anthropology, and his colleagues at the University at Albany and City University of New York's Lehman College have developed new experimental evidence indicating that these early hominins were walking with a human-like striding gait as long as 3.6 million years ago. The results of their research appears in Monday's edition of PLoS ONE, a journal from the Public Library of Science. A trackway of fossil footprints preserved in volcanic ash deposited 3.6 million years ago was uncovered in Laetoli, Tanzania, more than 30 years ago. The significance of those prints for human evolution has been debated ever since. The most likely individuals to have produced these footprints, which show clear evidence of bipedalism, or walking on two legs, would have been members of the only bipedal species alive in the area at that time, Australopithecus afarensis. That species includes "Lucy," whose skeletal remains are the most complete of any individual A. afarensis found to date. This morphology differs distinctly from our own genus, Homo, who abandoned arboreal life around 2 million years ago and irrevocably committed to human-like bipedalism. Since the Laetoli tracks were discovered, scientists have debated whether they indicate a modern human-like mode of striding bipedalism, or a less-efficient type of crouched bipedalism more characteristic of chimpanzees whose knees and hips are bent when walking on two legs. To resolve this, Raichlen and his colleagues devised the first biomechanical experiment explicitly designed to address this question. The team built a sand trackway in Raichlen's motion capture lab at the UA and filmed human subjects walking across the sand. The subjects walked both with normal, erect human gaits and then with crouched, chimpanzee-like gaits. Three-dimensional models of the footprints were collected by biological anthropologist Adam Gordon using equipment brought from his Primate Evolutionary Morphology Laboratory at the University at Albany. The researchers examined the relative depth of footprints at the heel and toe, and found that depths are about equal when made by a person walking with an erect gait. In contrast, the toe print is much deeper than the heel print when produced by a crouched gait, a product of the timing of weight transfer over the length of the foot. "Based on previous analyses of the skeletons of Australopithecus afarensis, we expected that the Laetoli footprints would resemble those of someone walking with a bent knee, bent hip gait typical of chimpanzees, and not the striding gait normally used by modern humans," Raichlen said. "But to our surprise, the Laetoli footprints fall completely within the range of normal human footprints." The fossil footprints at Laetoli preserve a remarkably even depth at the toe and heel, just like those of modern humans. "This more human-like form of walking is incredibly energetically efficient, suggesting that reduced energy costs were very important in the evolution of bipedalism prior to the origins of our own genus, Homo," Raichlen said. 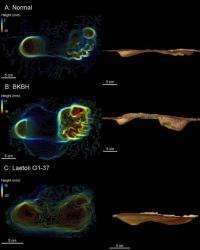 If the Laetoli footprints were made by Lucy's species, as most scientists agree to be the case, these experimental results have interesting implications for the timing of evolutionary events. "What is fascinating about this study is that it suggests that, at a time when our ancestors had an anatomy well-suited to spending a significant amount of time in the trees, they had already developed a highly efficient, modern human-like mode of bipedalism," said Adam Gordon. "The fossil record indicates that our ancestors did not make a full-time commitment to leaving the trees and walking on the ground until well over a million years after these (Laetoli) prints were made. The fact that partially tree-dwelling animals, like Lucy, had such a remarkably modern gait is a testament to the importance of energetic efficiency in moving around on two legs," Gordon said. This story shows why humans can climb trees so easily. They were made for the trees! Living in trees afforded safety from being eaten because spending a large amount of time on the ground could pose great threat to survival. Just how soon after becoming bipedal would we be expected to lose the adaptations that made us efficient at living in trees? What would drive the process? Wouldn't it still be useful to have those abilities even if they are only used rarely in emergencies? What other adaptations can we expect to lose now that we live in a technical society? Yeah, I know - "Mr Day, you aska lotta questions!" Yeah, this evolution business is not as effective as they make out. Just think how handy that tail would have been to drive the mouse on you PC! Why can't they repeat this test with some chimps? The foot action of a chimp walking upright must be different to that of a human and these imprints would show that.